A GERMAN COURT has refused Spain’s request to extradite former Catalan leader Carles Puigdemont on a rebellion charge following his arrest in Germany last month, ordering his release on bail pending a hearing on a lesser charge. 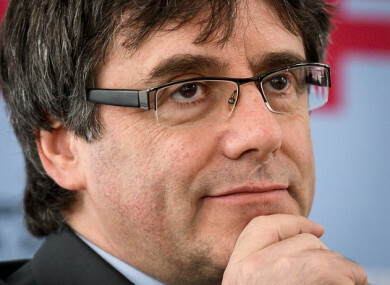 In a blow for Madrid, judges at the upper state court in Schleswig-Holstein “believe that in regard to the allegation of rebellion, extradition is illegal” as Puigdemont was not personally involved in violence during a referendum on Catalan independence last October. That made his actions not punishable under German law, the judges said in a statement, rejecting prosecutors’ argument that the Spanish “rebellion” charge was similar enough to Germany’s “high treason” statute to justify an extradition. Puigdemont can leave custody if he fulfils court-imposed conditions including a payment of €75,000. A spokesman at the Neumuenster prison where Puigdemont has been held since 25 March said he would not be released before tomorrow morning. “See you tomorrow. Thank you very much to everybody!,” read a tweet posted from Puigdemont’s account today. They “respected” judges’ decision to ask for more information from Spain on the misuse of funds charge in a “case with trend-setting significance for the European understanding of democracy”, they added. The misuse of public funds charge relates to the cost of the Catalan independence referendum, estimated at €1.6 million by Madrid. News of Puigdemont’s bail “will reduce tension and pressure in Catalonia” where protestors have blocked streets and clashed with police in recent days, political scientist Oriol Bartomeus of the Autonomous University of Barcelona told AFP. But the relief would only be “momentary”, he added, noting that “nothing has been resolved” by today’s decision. Public opinion in Spain is divided on whether the referendum constituted a “violent uprising” as described in the law. Catalans mostly reject the rebellion charges, according to opinion polls, with a major demonstration calling for imprisoned separatist leaders to be freed planned for 15 April in Barcelona. Email “Exiled former Catalan leader freed on bail by German court”. Feedback on “Exiled former Catalan leader freed on bail by German court”.